Our articles, tax tips and points of interest are designed to provide our existing clients and new customers with a quick overview of different areas of taxation, including policy and legislative changes. Tax law can be complicated and its application is often very much related to the circumstances of each individual. In other cases it can be very straightforward. Feel free to discuss any of the information in these articles with your Success Tax Professionals accountant. Our accountants use a thorough interview process to discuss benefits, legislative change and tax savings with our clients. Documentation such as receipts, travel diaries, formal paperwork and logbooks are all helpful supporting evidence in assessing tax outcomes. In many cases specific documents are required or potential deductions can not legally be claimed. Some records must also be kept in a certain way and with sufficient detail. Make the most out of your tax position by knowing what you can and cannot do and what supporting evidence you must have to validate your claims. 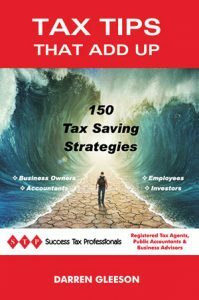 You c an purchase our new book ‘Tax Tips that Add Up’ here through vivid publishing. The book details tax saving strategies and ideas that if implemented will save you tax. It doesn’t matter whether you are an employee, investor, or business owner; there are tax strategies that may apply to your circumstances.